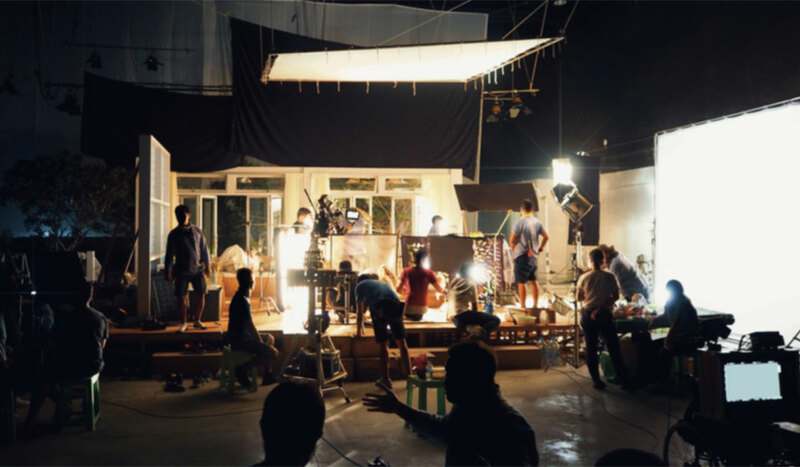 There are many unspoken rules and best practices for working on a film or video set. Here’s what you need to know your first time out. Sets are crazy, chaotic places. 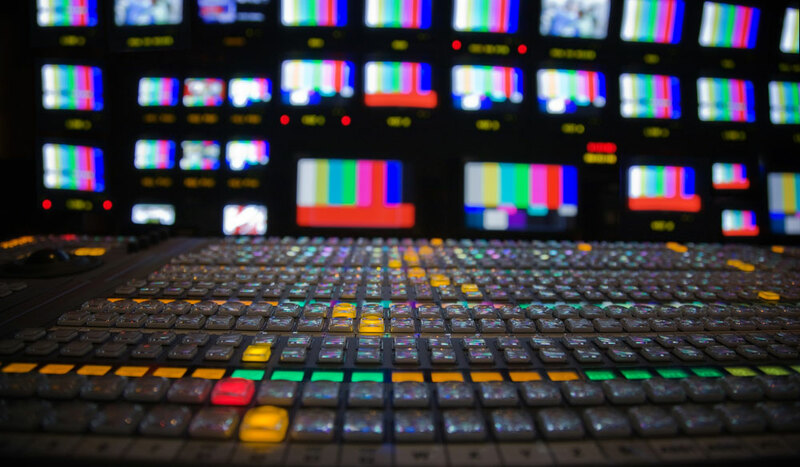 While school and small independent productions can help prepare you for working in the real world, each production is different, so you’ll have to do a bit of feeling things out, job by job. Sets function more like military units than your average 9-5 gig. The crew as a whole is collectively responsible for creating a film from nothing. One of the reasons crews can do this regularly (aside from experience) comes from some unspoken rules. These rules dictate many of the best practices and operating procedures, as well as the expectations of your peers and superiors. 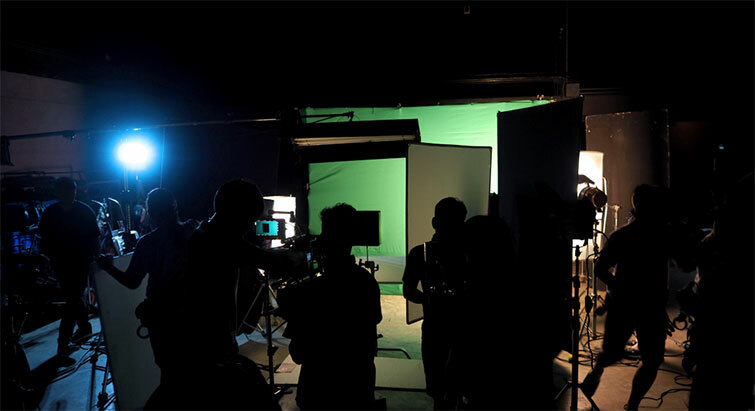 In this article, we will prepare for your first day on set by going through some of the basic ways that sets function, and how to use some of the more important assets you’ll get from the production — before discussing the attitude you bring to set. Preparation for your first day on set begins weeks before the cameras start rolling. There are a handful of things that you will be expected to know as you come to set on your first day. While this is far from an exhaustive list of the practices and doctrines of seasoned pros, these fundamentals will set you up to absorb as much knowledge as possible from your more-decorated peers. A large contributing factor to a crew actually finishing a project comes from the clear hierarchical structures, which comprise both individual departments and the crew as a whole. 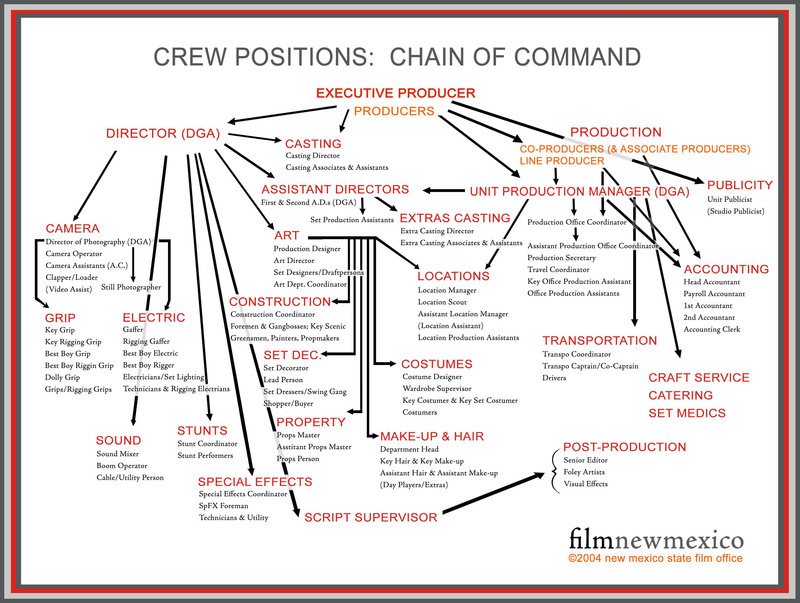 While this chain of command chart is a little busy, it should give you an idea of how each of the primary departments interacts with one another. Rather than memorizing each department and its subordinate positions, try to get a feel for why the departments are organized the way that they are before your upcoming production. With a framework in place before arriving to set, you will figure out the chaos much more quickly. Call sheets are the responsibility of an assistant director, and they are the strategic backbone of any well-run production. The call sheet contains all the important information you need to know for each day of set. These sheets usually detail the shoot address, relevant phone numbers, a basic shooting schedule for the day, and a full list of cast and crew — with their production titles. Fair warning: they are rarely pretty to look at. If you aren’t a spreadsheet junkie, going through one could cause your eyes to glaze over. Luckily, you won’t be tested on the full contents, but make no mistake, if you misread something on the call sheet, somebody is going to notice. Here is a call sheet for day 58 of production on V for Vendetta. It’s important to remember that call sheets are unique to the assistant directors creating them — this is just one example. The call sheet header contains a variety of information, including production title, production company, key production heads, set location(s) for the day, and the weather forecast. Different productions will include or exclude different pieces of information in their call sheet headers. Probably the second most important part of the call sheet is the day schedule. Typically just below the header, the schedule identifies all scenes being shot that day with their respective page numbers, total page length, cast, and any special needs for the particular scene. One of the most important parts of a call sheet is, well . . . the crew call section. 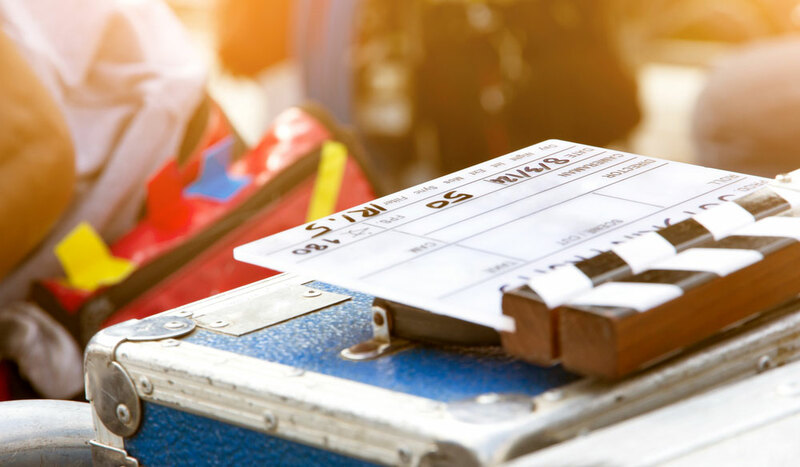 This section does more than just detail your “in time” — it also presents the call times of the whole cast and crew, their departments, and usually contact information for each person. Being familiar with this portion of the call sheet will give you a clear idea for who is doing what on set. Our example call sheet falls a little flat in this section, but it is still laid out in a way that will be familiar to you once you get your first sheet. If you are working on a project with high-profile talent or crew, chances are contact info and granular in-times won’t be on your call sheet. One of the final important components to the call sheet is the notes section. These notes reference any special equipment, dressing, propping, or other special needs for a particular scene. These notes are typically found at the bottom of the call sheet, but you might see them in other places, depending on your set. It is absolutely important that you never hold up the production. Always calculate your total transit time the day or night before a shoot and give yourself 30-45 minutes of extra time to get there, depending on how bad traffic usually is in your area. Always be at least 15 minutes early. Nothing screams preparedness like showing up on set with everything listed above as well as a perfect, three-hole punched script in a nice, clean binder. If you can’t haul your script around, make sure to have a copy pulled up on your phone, or have the “Sides” (pages of script being shot that day) handy. Important people lose track of theirs, and you can be the hero to keep the shoot going if you’re around when they ask to see the script. The most important thing to bring to set is also what the rest of the crew will notice most — a positive attitude. I know it’s cheesy, but showing up early, being eager to help, quick to ask questions, and invisible when you aren’t needed (all while being happy about it) will make your peers value your contribution. A positive attitude also helps you connect personally with other members of the crew, make friends, and thereby learn more. Don’t trash the production. Don’t be caught dead trashing another member of your crew. 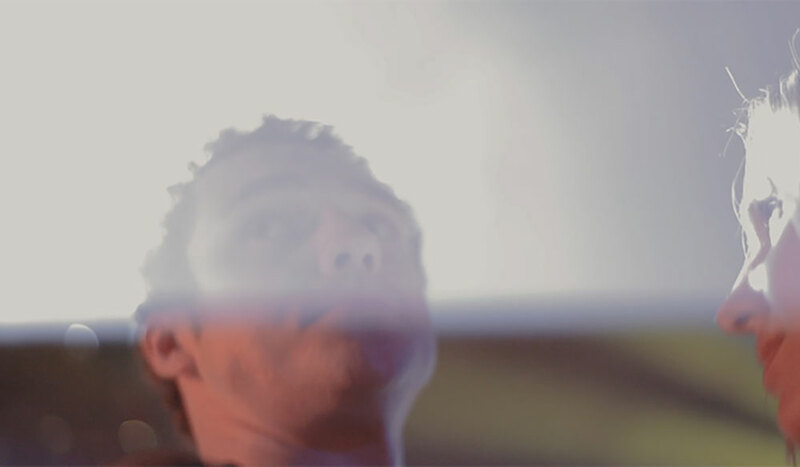 You will inevitably encounter people and personalities you clash with on many productions. Always remember to comport yourself professionally and separate yourself from any conversations that could cast you in a bad light with people who have the power to hire you again. Save the gossip for the wrap party — that’s what it’s for. Don’t pretend to know things you don’t. Be excited to learn. Be aware of your surroundings, and know the next steps of the production. Above all, just be friendly, and you will be off to a great start. 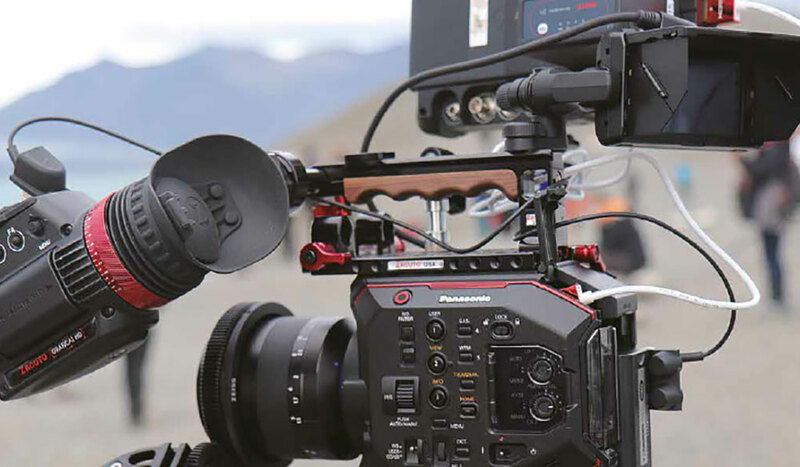 Film and video productions are a crazy, wild adventure — make sure that you are prepped and planned before each shoot so that you can enjoy the ride. Looking for more production tips & tricks? Check out these articles.